HCT targets are intended for the graphic arts only and MAY NOT BE SUITABLE for mission-critical or life-dependent applications such as medical, scientific or industrial use. 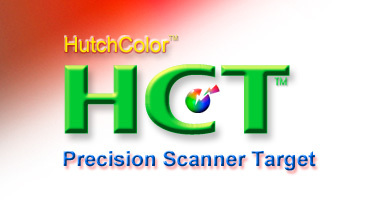 All HCT targets manufactured and packaged by HutchColor, LLC are warranted to be free of manufacturing defects for six (6) months from date of purchase. Claims related to measurement accuracy must be made within ninety (90) days of purchase. Due to instrumentation differences and other variables, HutchColor, LLC does NOT warrant how closely end-user measurements will match the supplied reference data. Minor design differences or cosmetic blemishes outside the working area are NOT covered by this warranty. All warranty enquiries must be handled through the original HCT dealer. Warranty claims must be accompanied by the target in its original packaging, complete with serial number sticker and a copy of the original invoice with date and vendor clearly visible. Liability is limited to re-measuring or replacement of the target at the sole discretion of HutchColor. A charge will be made for re-measuring if the problem is found to be due to aging, wear and tear and/or improper storage or handling. Regardless of outcome, return shipping and insurance are payable by the client. This warranty is valid for the original end-purchaser and is non-transferable. Because ICC profiles are critically dependent on software and hardware, the performance and/or accuracy of ICC profiles made from the HCT are NOT warranted. Hutcheson Consulting does NOT warrant or endorse any third party hardware or software. All photographic materials are known to fade or discolor over time. Hutcheson Consulting does NOT warrant the HCT against dye-fading or discoloration. This warranty does NOT cover scratching, fading or deterioration of the HCT due to aging, handling, exposure to light, improper storage, or normal wear and tear.